It is all about the Flying Geese for my next project. A simple design featuring fabrics with clarity. Less is more. Red - Black - Orange and ... Grey. I think that the color gray has a lot of power...and it's really under-utilized. I can't wait to see what you've done with this one! this is so, so gorgeous. it's pretty similar to what I've been wanting to do with a particular stash I just accumulated. but, I've never braved flying geese before (I was actually considering just doing half-square triangles to avoid it!). do you know of any good online tutorials I should check out, or a particular ruler I need to get? Rita - I really like the color combination here. I love how the gray sort of tones down the contrast between the red and black. Just gorgeous. Such a pretty colour combo! Absolutely stunning. I'm gonna love this one. Lots of warm colours ... my faves! 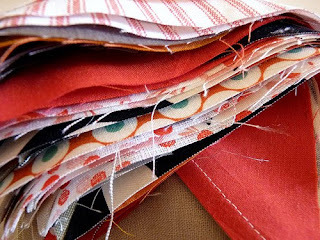 I love this colour combinations - it is going to be a beautiful quilt. That's going to be beautiful, Rita. Can't wait to see! 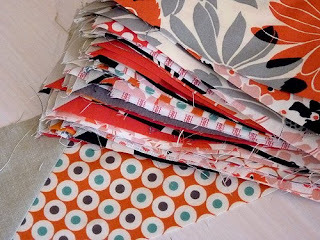 Orange is such a wonderful color, so this will be a wonderful quilt! This is a great color combination. 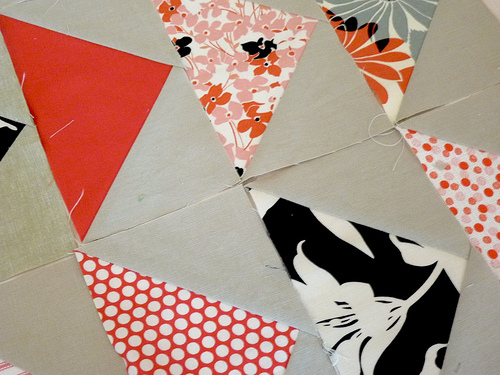 I'm sure the quilt will be stunning. Gotta love the classics! Can't wait to see the "flying geese" quilt in it's entirety. What a great look, is this a collection or your own choices? I have been working on some wonky flying geese with Kona Cotton "Ash" as the background colour to the geese. Not sure if anything is going to come of them. It's the first time I've made flying geese, and I'm really enjoying it. I just love this one...so much. I've been stashing fabrics in these colours for ages now but the drawback of the op shop thing is it just takes so long to get a collection together...sigh. so my colors!! i love it!